Adults on average gain almost a pound of fat a year as we age. What causes this gain in weight? Changes in diet such as eating more unhealthy foods like potato chips, fast food, sugary drinks, processed foods, breads (white being the most abused), and cereals that are full of empty calories. Other reasons: decrease in fruits and vegetables, whole grains, less physical activity, and poor sleeping habits. In a study reported in the New England Journal of Medicine, 121,000 participants were tracked for 20 years. Every four years they gained an average of 3.35 pounds and in 20 years gained almost 17 pounds. Those who made the most unhealthy choices gained nearly 4 pounds more every four years than those who made healthy choices. Those who ate an extra serving of chips a day gained an average of 1.7 pounds every four years than those who didn’t. Those that drank one more sugary drink a day added an extra pound or more every four years that those who didn’t. An increase in watching TV combine with a lack of physical activity, increased alcohol intake, and getting less than six hours of sleep also played a role in weight gain. Don’t just watch your fat or sugar intake, if you do and don’t watch your portion sizes, you’ll still gain weight. Watch what you eat and how much you eat, along with healthy choices to keep your weight down a you age. Combine broth and next 5 ingredients (broth through crushed red pepper) in a bowl; stir well with a whisk. Heat 1 teaspoon oil in a large nonstick skillet over medium-high heat. Add the chicken; sauté 4 minutes. Add bell pepper; sauté 3 minutes. Remove from heat. 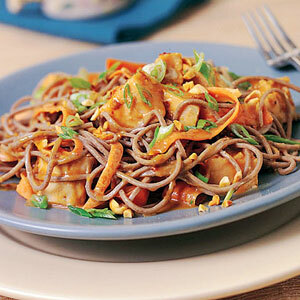 Combine chicken mixture and noodles in a large bowl. Heat 1 teaspoon oil in pan over medium heat. Add ginger and garlic; cook 15 seconds. Stir in broth mixture; cook 30 seconds, stirring constantly. Add the broth mixture and 1/4 cup green onions to noodle mixture; toss well. Sprinkle with 1/4 cup green onions. Cortisol keeping you down? Now you may not have heard of cortisol or know what it does, but it could be the reason you’re not gaining muscle! Cortisol is a hormone released in response to stress. In a catabolic (muscle eating) fashion it reduces protein synthesis which prevents muscle growth. If you have a hard time putting on muscle you may want to cutback or even cut out cardio. Despite the benefits of aerobic exercise, too much can keep you from gaining muscle. Too much cardio increases cortisol levels. Levels start to rise after 60 minutes of exercise. 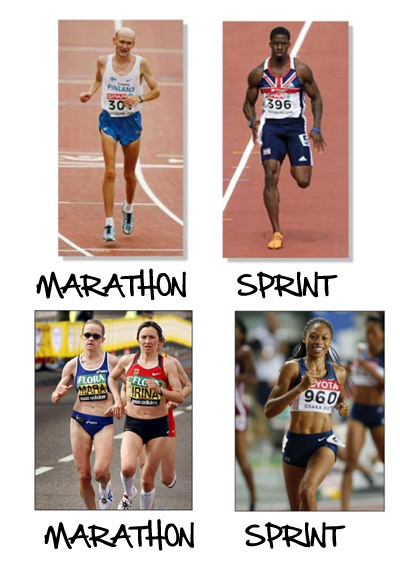 This occurs in response to low glycogen stores. 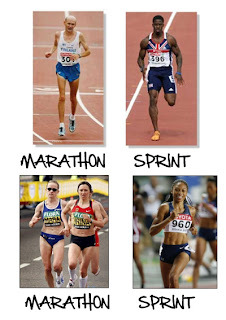 The increased levels will eat away muscle fibers, reversing the effects of training. Keep your cardio sessions to a max of 40 minutes and start doing HITT for 20-30 minutes. You might want to reconsider doing leg extensions. 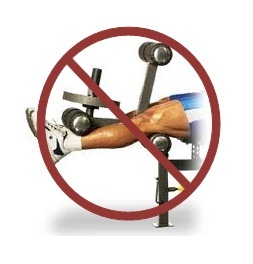 The leg extension machines safety and efficiency is one of most controversial subjects. It isolates and strengthens the quadriceps, but at what cost. The risk may outweigh the rewards. Physiologists at the Mayo Clinic determined that leg extensions place a lot more stress on the knee joint than a squat, even under load. Why? The resistance near the ankles lead to high amount torque on the knees every time you lower the weight. So do squats or lunges, they’re actually much safer. 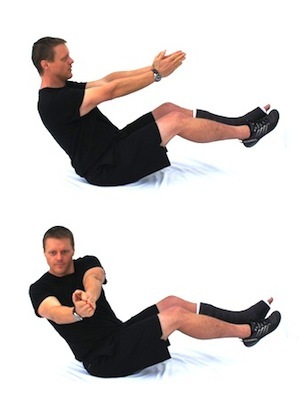 Another issue would be this exercise can place shearing forces on the knee, which increases the risk of injury. Researchers found when comparing closed kinetic chain exercises (squats) and open kinetic chain (leg extensions) exercises that there was tension on the ACL occurred during full extension phase on the leg extension. A study published in the Journal of Orthopedic Sports Physical Therapy in November 2003, researchers found that subluxation (knee dislocation) was greater during leg extensions compared to a squat. Hold on to a chinup/pullup bar with an overhand grip and hang at arm’s length. 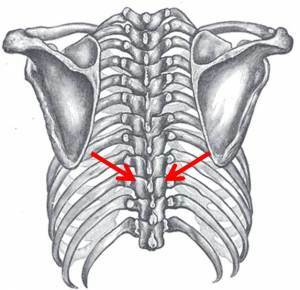 Without moving your arms, pull your shoulder blades down and squeeze them together (refer to pic). Men should be able to hold for 10 seconds, women for 5 seconds. If you can’t, you have an upper back weakness and you should make this exercise part of your workout. This movement is key to doing proper pullups/chinups. It will also train your shoulders to be down and back, which will promote good posture. If you’re unable to perform a chinup check out my CHINUP PROGRAM.